I am interested in a human being, who is safe, but unwilling to accept others who are fleeing war, conflict, oppression, death and hunger. I’m interested in the situation of conflict, danger and suffering. And what that fed, happy, Western European man would feel in such a place, and what he would feel towards people whose daily reality is a struggle for life. One of the elements of the spectacle is the documentation of performance From the water, which took place on the beach in Sopot, in October last year on the Solidarity Day with Refugees. 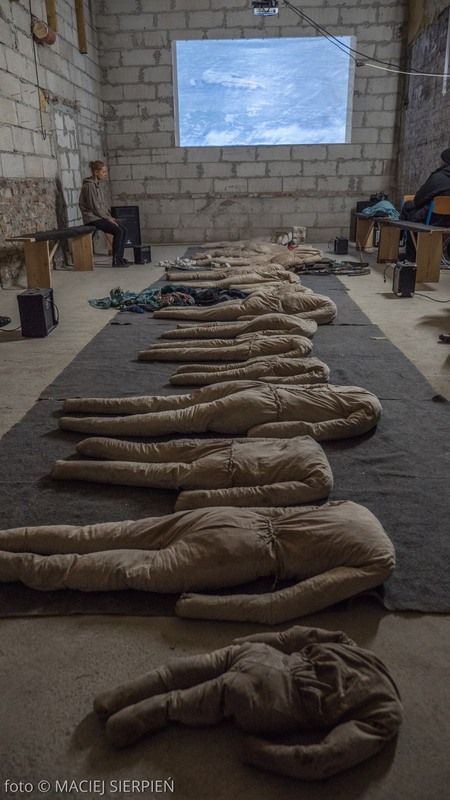 It was my comment on migrants dying at sea, bringing the images into our reality, Polish, tangible. To rise empathy in viewers, unresponsive observers. Independent artist and performer associated with the contemporary dance scene in Gdańsk and Britain. Author of several powerful and original solo performances, in which she speaks out against domestic violence among other topics. She is the author of several original dance shows, including solo performances (Zanzibar, Unfinished, Knife, Horse and Stairs, Acts, Thou Shalt Not), installations / performances (No 1, Four Corners, Act for Two – Leftovers, Without Home),and animations (the series Winter 2010). Multi-disciplinary artist with a vast international performing and teaching experience in various fields of the performing arts.Avant garde musician, dancer, writer, choreographer, visual artist, filmmaker, theatre director and dramaturg.His main area of interest is avant garde experiments within the performing and visual arts and in particular the relationship between sound, body, space and context. Uno degli elementi dello spettacolo è costituito dalla documentazione della performance From the water, tenutasi sulla spiaggia di Sopot, lo scorso Ottobre in occasione della Giornata della Solidarietà per i Rifugiati. Era la mia posizione riguardo ai migranti morti in mare, rendendo quelle immagini tangibili nella nostra realtà Polacca. Per suscitare empatia negli spettatori, privi di partecipazione. Artista indipendente e performer rappresentativa della scena contemporanea di Gdańsk e in Gran Bretagna. Autrice di numerose performance soliste forti e insolite, in cui dichiara la sua posizione di condanna verso la violenza domestica, tra gli altri temi. Artista pluridisciplinare con una vasta attività internazionale di insegnamento e performativa. Musicista di Avantgarde, danzatore, scrittore, coreografo, artista visivo, filmmaker, regista teatrale e drammaturgo. La sua area di interesse principale è l’avanguardia sperimentale tra performing art e arti visive, nello specifico la relazione tra suono, corpo e contesto.